The Scottish Government has been urged to draw up contingency plans over fears one of the firms behind the city bypass is on the brink of collapse. Carillion is the lead consortium partner on the £745million AWPR, working with Balfour Beatty and Morrison Construction under the Aberdeen Roads Limited banner. But the company is understood to be chasing £300million in emergency funding as it struggles under reported debts of £1.5billion and a £587million pension deficit – and according to reports, adminstrators could be called in today unless shareholders, creditors or the government can stump up the funds required to save it. 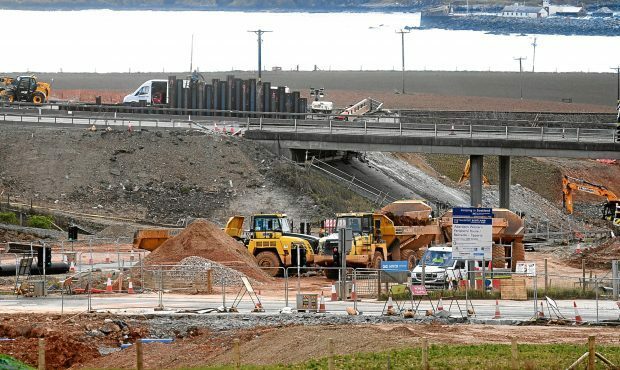 Last night, transport bosses insisted that even if the firm does collapse, the delivery of the long-awaited Aberdeen bypass will not be affected as the other project partners have agreed to step in. Now Aberdeen South MP Ross Thomson has called on the Scottish Government and Transport Scotland to assure north-east workers and their families further. He said: “Clearly, Carillion is in difficulty at the moment, and we hope that ongoing efforts to restructure the company and secure its future will prove successful. “While Carillion works across the UK, it also has responsibility for the Aberdeen bypass project, which is of vital importance to the north-east. Transport Scotland has said that the future of the bypass is not in doubt, regardless of Carillion’s financial state, due to the partnership approach of Aberdeen Roads Limited. The organisation also confirmed that work on the 36-mile route is still expected to be completed this spring. Carillion is one of the largest construction firms in the world, with 43,000 members of staff globally. The state of its finances has contributed to a large drop in share prices, which have plunged by more than 90% in the last year. Yesterday crunch talks with company bosses were held at Whitehall on how the company’s collapse could be prevented either by reducing its debts, attracting more investment or restructuring its balance sheet. The TUC union’s deputy general secretary, Paul Nowak, called for any jobs at risk to be protected, adding: “Workers, taxpayers and public service users could well be left to carry the can. “Carillion is a textbook example of the failures of privatisation and outsourcing. Conservative party chairman Brandon Lewis said in a BBC interview that ministers were keeping a “very close eye” on the matter. As one of the world’s leading construction companies, Carillion has a number of high-profile ventures on its books. Among these is the building of the HS2 rail link which, with a price tag of £56billion, is thought to be Europe’s largest infrastructure project. In 2014 it was handed a contract worth up to £1.7billion for facilities services at 30 military sites including RAF Lossiemouth, RAF Leuchars and Kinloss Barracks. Following another contract win last July, the firm now maintains 50,000 homes for the Military of Defence, including a number in Scotland. Carillion is the UK’s second-largest supplier to Network Rail. Earlier this month it celebrated “another successful project” installing new crossover panels as part of £23million of improvements at Edinburgh Waverly train station. In recent years the company has completed construction work on GCHQ’s circular “doughnut” offices and the Tate Modern art gallery in London. Carillion boasts a hefty client list in the oil and gas sector, with customers including BP, Shell and Total using its housekeeping, medical services and catering offerings. It is also responsible for the maintenance of 25,000 miles of road in Canada, serving 32,000 school meals every day, and the employment of more than 8,000 healthcare professionals in the UK.